This is a photograph from the 30th Annual AXA Raheny 5 Mile Road Race 2014 took place in Raheny Village, Dublin, Ireland on Sunday January 26th 2014 at 15:00. 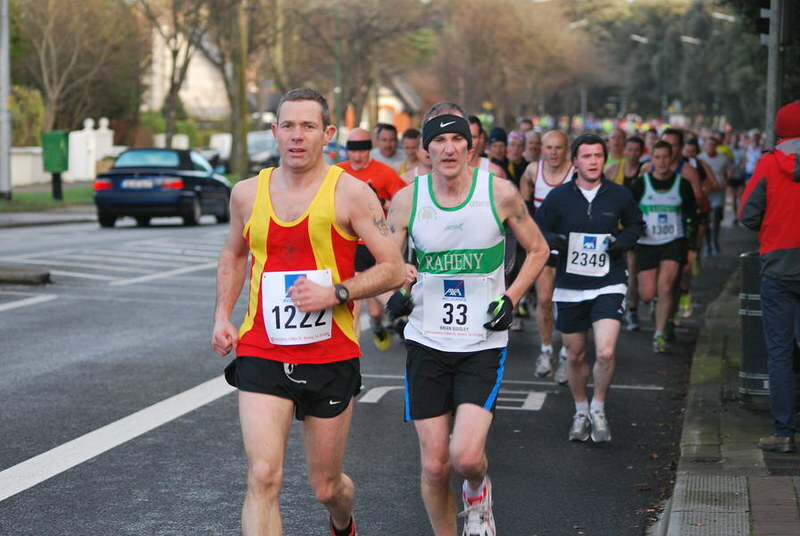 The ‘Raheny 5’ has become one of the most famous road races in Ireland. The race has continued to grow year-on-year and this year was no exception on the year of it’s 30th Anniversary. Almost 3,000 participants took part in the various events of the day. The incredible voluntary organisational work carried out by Raheny Shamrocks and the local community in staging the race every year must be acknowledged. The weather was postively wintery today. There was an icy wind blowing into the face of the runners at various points in the course. This made for some very variable mile-splits. Overall the weather was favourable in that the rain stayed away and there was some helpful ‘wind at the back’ for the runners in places. The race route starts at All Saints Park and goes into Raheny Village via Watermill Road. The route then turns west and along the Howth Road before turning left onto Sybill Hill Road. The route then turns left again onto Mount Prospect Avenue and continues until you run down to the sea-front and the Clontarf Road. The only real hill in the course is at the left turn from Clontarf Road onto Watermill Road. Finally, at the North East end of St. Anne’s Park the race turns left and makes it way to the finish which is positioned at the start area of the race. Attribution– anyone using our photographs gives us an appropriate credit for it. This ensures that people aren’t taking our photographs and passing them off as their own. Yes – of course you can! Flickr provides several ways to share this and other photographs in this Flickr set. You can share to: email, Facebook, Pinterest, Twitter, Tumblr, LiveJournal, and WordPress and Blogger blog sites. Your mobile, tablet, or desktop device will also offer you several different options for sharing this photo page on your social media outlets. In summary please remember when requesting photographs from us – If you are using the photographs online all we ask is for you to provide a link back to our Flickr set or Flickr pages. You will find the link above clearly outlined in the description text which accompanies this photograph. Taking these photographs and preparing them for online posting does take a significant effort and time. We are not posting photographs to Flickr for commercial reasons. If you really like what we do please spread the link around your social media, send us an email, leave a comment beside the photographs, send us a Flickr email, etc. If you are using the photographs in newspapers or magazines we ask that you mention where the original photograph came from. Image published by Peter Mooney on 2014-01-26 17:43:35 and used under Creative Commons license.